Last week, I made my way over the border into MA for lunch with a friend. Living where I do, there’s a neat back way to get to Pittsfield that involves a lot of winding roads and rolling countryside. You know what that means: farm stands everywhere! No exaggeration. On the 45-minute drive, I saw at least four farm stands and several “country stores.” Of course, I had to stop at one on my way home. 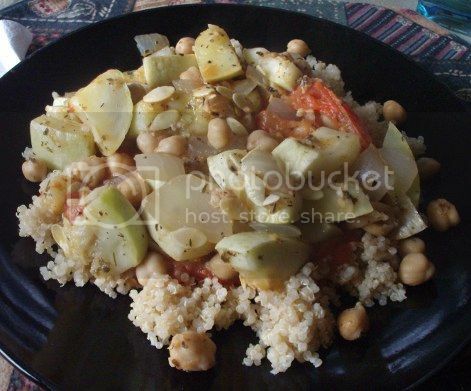 While browsing at a particularly quaint one (the name of which, alas, escapes me), I found a random squash that the woman at the stand called a “Mediterranean zucchini.” After a little Googling, I came across some pictures of Lebanese white bush squash that seem to match what I got. Despite repeatedly reading that it’s a summer squash, the look of the outside made me expect a winter squash interior when I cut into it. Not so! The inside turned out to be a sort of cross between zucchini and eggplant: crisp and wet like zucchini around the edges but with a softer center. It would probably be quite a good squash for stuffing, but for my first taste of it I decided to do a roasted veggie dish with some chickpeas thrown in for a protein boost and a little extra texture. This is a simple, quasi-Italian recipe that puts together summer squash, tomatoes, and onions with garlic and Italian seasonings. If you can’t find Lebanese white bush squash, go ahead and use anything that sounds good: zucchini, yellow squash, or even eggplant! It’s a great way to make use of the last of the summery produce. 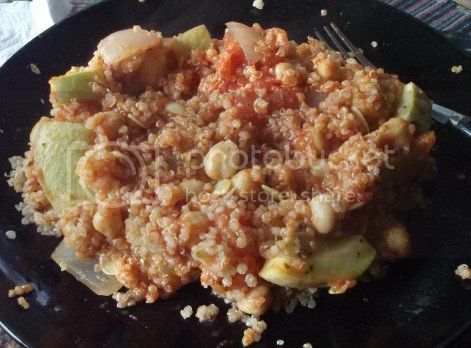 Serve it over some quinoa cooked in vegetable broth or your favorite whole wheat pasta. 1) Preheat the oven to 400°F. 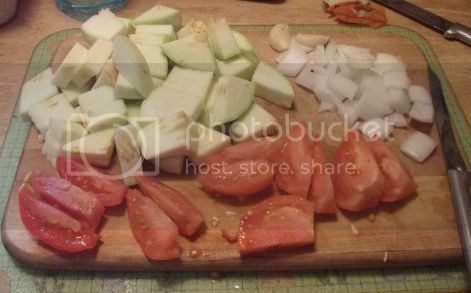 Get all the veggies chopped and ready to go. 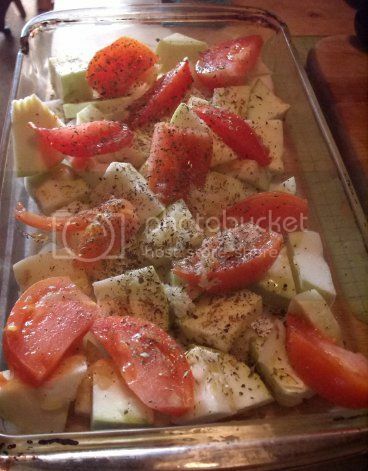 2) Place the onion, tomatoes, and squash in a large glass baking dish and drizzle with the oil. Add herbs, salt and pepper to taste. Crush the garlic on top and stir until everything is well-coated. Roast for 20 minutes, stirring once. 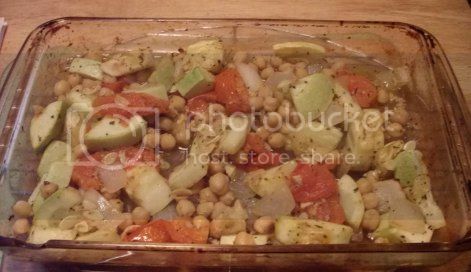 3) Add the chickpeas to the roasted veggies, stir again, and put back in the oven for 10 minutes more, until everything is tender and the vegetables have released some of their juices. 4) While the veggies and chickpeas are cooking, warm the pasta sauce in a small saucepan over medium heat. 5) When everything is roasted and warm, plate the quinoa or pasta, spoon sauce over it, and add the roasted veggies on top. Thank you. I had no idea what was in my garden or what to do with the squash. Looking forward to making this!